Are you looking for a top-quality, affordable coffee grinder for your home or office? Then the KitchenAid coffee grinder should be at the top of your list. Read our buying guide packed with information to help you decide if it’s right for you. Don’t settle for the store-bought ground coffee for your brewed coffee. Grind your own coffee beans with the KitchenAid Coffee Grinder. This is one of the easiest to operate coffee processors you can find today. It is also something worthy to spend for especially that this kitchen gadget is features-filled. Whether you’re brewing for two, or for a big number of people at home, you’ll still find this kitchen gadget very functional. You can easily view the grinding status with this machine’s clear cover. The one-touch operation lets you grind effortlessly. Not only that, this easy button does fast grinding so you can make more coffee grounds at an instant. At such a low price you can guarantee a durable product in this kitchen equipment. It has stainless steel blade that surely lasts for years. More so, the 1-Year Warranty that comes with this product gives you the opportunity to experience total satisfaction with it. There might be a need to shake at times to properly grind despite the one-touch operation. Okay, so we know you want to make yourself that perfect cup of coffee in the morning. This starts with a coffee grinder. 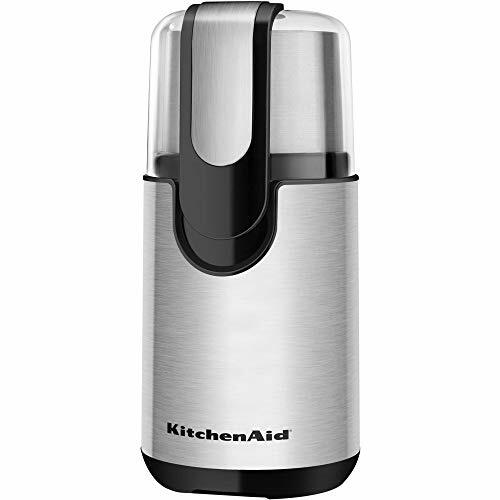 Besides this one from KitchenAid, there are plenty of other top picks. Here are some of our favourites: The Best Coffee Grinders. 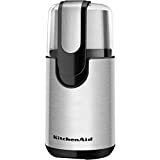 If you are looking for an excellent coffee grinder for home use, the KitchenAid Coffee Grinder is a perfect choice. This machine performs excellently as if you’re making coffee grounds a la famous coffee shop. You’ll find total convenience using this coffee grinder. With its transparent top cover, you can easily view the grinding status. It is so easy to clean this kitchen must-have too. All you have to do is put the blade, the top cover, and the bowl itself, straight to the dishwasher for fast and easy cleaning. If you need to brew more cups of coffee and you want all your beans home-ground, it is so possible. With this top of the line coffee grinder, you can quickly grind whole coffee beans equivalent to up to 12 cups. We’ve got even better news for you! This bestselling kitchen item is ideal for grinding spices and herbs too! So, if you think you don’t need this because you are not a coffee enthusiast, you will surely think again. This equipment is a perfect cooking assistant too! What are your thoughts about this top-quality coffee grinder? Leave a comment below and let us know what you think.